Pottery Barn Kids totally nail it when it comes to crafting insanely cute toys that lure kids away from those pesky screens. 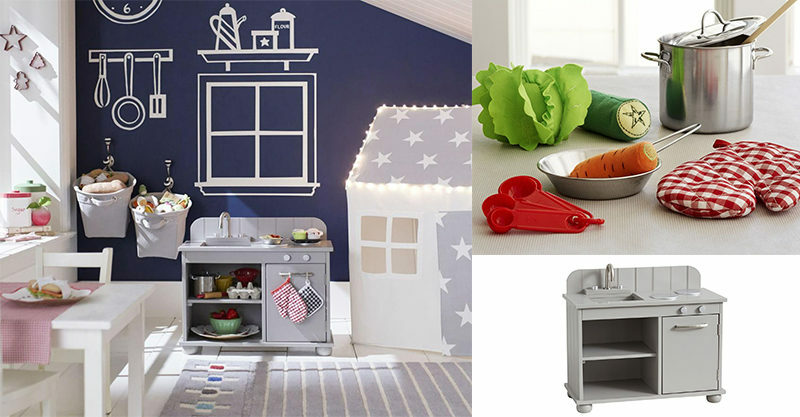 Their range of kitchen-themed toys for tiny foodies is no exception! The clever design folk at Pottery Barn Kids have combined quality with sized-down adorableness, creating foodie toys that will delight any child (and child-at-heart!) The Catalina All-In-One Kitchen, for instance. It brings pint-sized New York Loft sophistication to your toddler or preschool play room AND sparks lots of open-ended, imaginative play for your child, in the process. 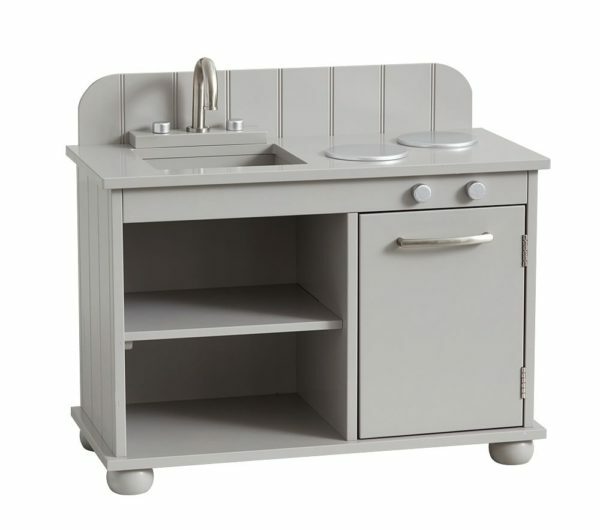 This timber and MDF play kitchen features a toy sink, a toy two burner stove top and a play oven. There’s two shelves under the sink, so you child can neatly stow their pots, pans and dishes – and the knobs on the taps and oven turn, just like the real thing! Trust the Pottery Barn gang to realise that parents want toys to be good AND look good, too! The Catalina All-In-One Kitchen retails for $249 and is available in Grey, Red and Simply White. Of course, every kitchen needs some recipe inspiration, so this Mini Cooking Set should go straight to the top of your Christmas kiddo shopping list as well. Your tiny, pot-stirring Masterchef can then whip up today’s carrot and cucumber sprinkled special – as that heartbreakingly adorable tiny oven mitt teaches some early lessons about safety. There’s a stock pot, frying pan and measuring spoon set included, too. Pottery Barn Kids Mini Cooking Set retails for $34 AUD. Throw in a Pottery Barn Kids Kitchen Tools Set and your child will be cooking with (pretend) gas! 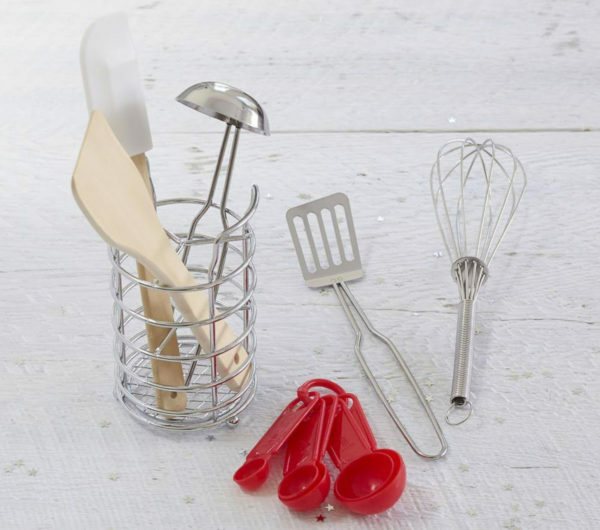 This cute set features pint-sized wooden or stainless steel whisk, spatula, spoon, wooden spatula, measuring spoons, trimmer, and utensil holder. They’re sized perfectly for little hands and little imaginations! 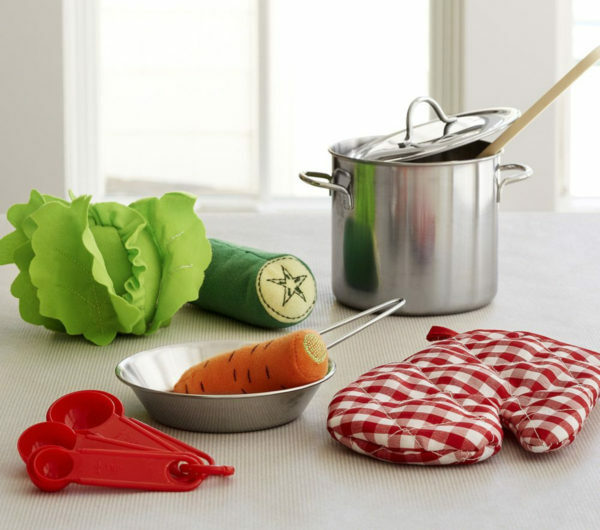 Pottery Barn Kids Kitchen Tools Set retails for $29 AUD. If you’re keen to start conversations about where food comes from and encourage healthy home-cooked habits, you might want to pop these genius things from Pottery Barn Kids on your child’s Christmas list!